How could the Chinese republic celebrate its centenary? Next year marks the centenary of the founding of the Chinese republic. We got rid of our rather hopeless Ching Dynasty, and ushered in Asia’s ﬁrst democracy. 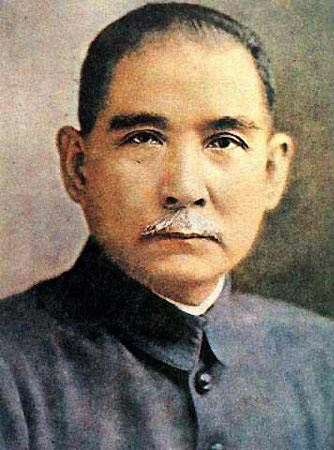 Both the Republic of China and the People’s Republic of China see 1911 as an important year, and Dr Sun Yat-sen as the founder of the nation (here is a page from the Zhongshan government on Dr Sun which—shock—even mentions democracy). As the father of the country, his legacy one of the few things nationalists and communists agree on, even though technically the two sides remain in conﬂict and are in a state of Civil War. The Republic began on October 10, 1911, a date which tends to be celebrated by many, though it was formally declared on January 1, 1912. So, what might 2011 bring in terms of perspective? that both sides of the political argument agree there are more commonalities than differences between all Chinese peoples. I doubt we’ll see political unity while Beijing is still governed by the Communist Party, which sees little point in changing its own structure to accommodate territories it considers its own. We see a similar view, ofﬁcially, within the Kuomintang, interpreted in its favour. The regular triumph of ideology over practicality and the prospect of a joint future growth of ‘China’ gets in the way; the idea of an economic union or commonwealth might be the easiest way forward. Never mind what you call it internally, it is a solution in which both sides can claim victory, preserve face, and avoid bloodshed. The fact that no armistice has been signed by both signs is actually an advantage—because it means this difference of opinion can be solved technically as an internal matter, not one between two sovereign states. This is not an idea that the diehards like, so let the name-calling begin in the comments. But remember in whatever debate we enter, we should think of this question: since we all dislike what the Ching Dynasty did to China, what is the best way to honour the memory of the founding father of the nation in 2011?